We arrived back at our hotel in Cusco in the early afternoon. I was exhausted so opted not to join Mike and Susana to go to the Sacsayhuaman ruins, which I had seen with Dave. Instead I relaxed at our B&B, had a nap, re-packed and had a nice long hot shower. I met them in the centre of town at the hotel where Susana’s brothers were staying and we all went out for dinner after a quick visit to the San Blas cathedral, where there was actually a wedding going on. After dinner a few of use went on a min-pub crawl. I was amazed that I was still awake when I looked at my watch and it was 2am. I decided it was time to head to bed! Sunday was our last day in Cusco. We took advantage of it by taking a tour to see yet more Inca ruins. I had no idea there was so much to see in and around Cusco. We were picked up at the B&B at 8:30am and headed out of town. Our first stop was a small museum with artifacts from Inca times. After that, we stopped at a town whose industry is making clay roof tiles and were given a demonstration. Then it was on to Pikillacta. We stopped by the Gate to Cusco (see photo above), a ruin that was likely built originally before the Incas by the Wari’s, but was adapted by Inca’s. It consists of a large wall and is known as the gate to the sacred city of Cusco. Pikillacta is just down the road. 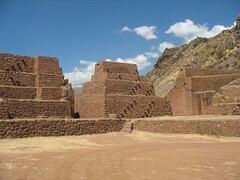 It also is pre-Inca, and consisted of the ruins from a village. You could still see the walls of many houses, and the white “paint” that they used on them. From there we had a lunch of duck (it was a huge plate of duck!) near Laguna de Huacarpay, which is a protected area where a lot of migratory birds come from North America. The duck we had had been raised for the purpose and was not one of the migratory birds! We had dessert across the street at a little shop. After lunch we continued to Tipon, stopping at a town known for their bread. We were shown a bakery and bought some of the bread, which was indeed delicious. However, after all the food so far that day I didn’t really want to eat ever again! 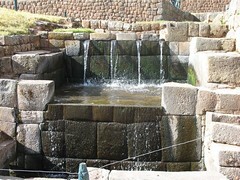 Tipon is a large Inca ruin which was used to collect water for religious purposes. Supposedly the water was not used for agriculture. It consisted of several terraces and many channels carrying water from a distant spring. We wandered all around it and walked up the hill to see some more of the ruins and the channel that carried the water from the source. On the way back into Cusco, we stopped at a hacienda, which is a large house from colonial times. It was not actually open to the public, but our driver knew some people who let us in and showed us around. It is currently being restored. It was quite impressive, and it was interesting to see something from the colonial era, instead of the Inca era. Back in Cusco I tried to nap before again heading into the centre for our last night in Cusco. We had dinner (although no one was really hunger, since we had a giant duck lunch and the others had had the sacred valley buffet) and said some goodbyes. Then I headed out for a drink before heading back to the hotel exhausted at about 11pm. Monday we headed back to La Paz. First we took a bus from Cusco to Puno, arriving there in the afternoon. We were met by a private car that took us to the border in Desaguadero. We got there just before 8pm and were a bit worried that the border closes at 8pm, so rushed to get our paperwork done and get back into Bolivia. On the bolivian side, we were met by one of the office drivers who we had arranged to pick us up there and drive back to La Paz. We arrived back here at about 9:30pm. The only major hiccup of the day was when our bus pulled over for seemingly no reason and sat on the side of the road while the driver and a mechanic tried to fix the engine! Luckily they managed to do it in about 30 min. So I am back in La Paz after a great trip to Peru. I can’t wait until my next jungle adventure … whenever and wherever that will be! Submitted by Tina (not verified) on Thu, 2007-08-23 02:54. This trip sounds phenominal Meghan! I'm already planning my visit! Thanks for sharing! Submitted by Micah (not verified) on Fri, 2007-08-17 15:10. Wow Meghan, looks like an amazing trip! Very jealous of you getting to 'ruin burn out'! I have been following your trips and all the events that have been transpiring down in Bolivia! Keep having a great trip, keep having fun, and keep up the stories!